Bora & Sre Leap have a small piece of land with a small covered area for English classes and church services. 3-4 adult believers and around 20 children. They are both graduates of the Prek Ambel Training Center (2010). Bun Tooun is a farmer and a pastor. Five small groups meet weekly and then come together for joint worship once a month. Five other men assist Bu Tooun with Bible study and evangelism. Brother Chheng visits these men once a month to teach and preach. 15-20 adults and 30 children when the groups meet together. The group at Koh Tome has a meeting of about 20 people per week. They meet on Sunday evenings. Daniel and Theary have established a growing English school as well with over 300 students. It’s very early in the process as they’ve only been in Chreay for 3 months. They plan to teach English and the Bible to the children. They are making contacts and praying. 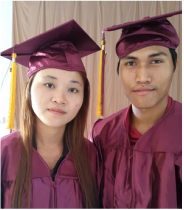 They are both graduates of the Prek Ambel Training Center (2014). Both English teachers in the PATC. 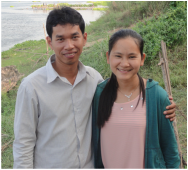 Savout is a leader in the Prek Ambel church and a full time evangelist and his wife is also working for a local language school. 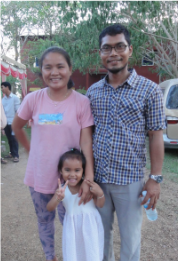 They are both graduates of the Prek Ambel Training Center (2012). Moved from Prey S’day to Sompan and started another school to reach out to more students. 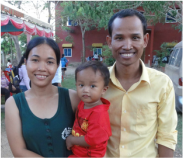 Brother Vanak is a leader in the Prek Ambel church and helps with church outreach. They are both graduates of the Prek Ambel Training Center (2010 & 2012).